Ben Rivers’ recent short, Things (2014), is an intimate tour of the filmmaker’s own domestic space and personal effects. Including photographs and movie stills, squirrels in the yard and trinkets on the shelves, beloved tomes ex libris Ben Rivers, and sound samples of Andy Kaufman and a National Geographic flexi-disc of a whale song, it’s a film of treasures, but also a self-portrait rendered as a collage of fetishized objects. This is a strange form of auto-ethnography, especially from an artist who has become increasingly associated with a certain brand of radical, and even problematic, anthropological filmmaking in the tradition of Robert Flaherty, Jean Rouch, and Robert Gardner. Most of Rivers’ other films take place afield—distant episodes, you might say—but for this film he has turned his gaze, if not exactly inward, then at least towards the artifacts and materials that make up his most intimate spaces. After this litany of treasured items, the film ends with an extended walkthrough of a minutely detailed CGI rendering of Rivers’ apartment. Another paradox: Rivers’ trademark grungy 16mm CinemaScope is replaced by the work of a commissioned video-game designer. This makes for a shocking contrast to Rivers’ style, but one could also take it as the ultimate expression of artistic control, replacing Rivers’ messy images, filled with thousands of tiny accidents of material and texture, with a clean, precisely detailed digital model: a created world to perfect creation as he knows it. In other words, while we are used to harbouring a general mistrust of the image—its implicit ideologies and its mechanisms of control—it’s still important to wrestle with the problems of cinema, its triangulations of makers and subjects and apparatuses. While digital animation aims for greater, more perfect verisimilitude, the chance meeting of the camera and the profilmic is perhaps more crucial than ever. The moment of filming an image, rather than shaping one, becomes an “ethical encounter,” one that by its very nature is fraught with countless contingencies and modes of interrelation. Rivers’ latest work is a sprawling set of projects whose variety, size, and complexity matches the verbosity of its title: The Sky Trembles and the Earth Is Afraid and the Two Eyes Are Not Brothers. A diverse set of excursions into Morocco’s Sahara and Atlas Mountains, The Sky Trembles comprises a book, an installation, a feature film projected in 35mm, and a short, each overlapping and intersecting one with the other, and with myriad other films and stories. The project derives its lengthy title from a crypto-apocalyptic pronouncement Paul Bowles apparently overheard in a bar and later included in his kif-fuelled story “He of the Assembly.” Indeed, a great deal of this set of works exists in Bowles’ universe: there are appearances by the Moroccan storyteller Mohammed Mrabet, whose stories Bowles began translating in the late ’60s, and even an adaptation of Bowles’ 1947 short story, “A Distant Episode,” which functions as the narrative and philosophical core for Rivers’ feature film. The original story is something like a more curt, brutal precursor to Bowles’ novel The Sheltering Sky, a tale of a haughty Westerner, known only as the Professor, who is drawn into the impenetrable Otherness of North Africa and ultimately swallowed up by it: kidnapped, beaten, and—clad head-to-toe in a suit made of tin-can lids—made to serve as a kind of jester or plaything for a group of bandits. In Rivers’ version of Bowles’ story, the protagonist is not a professor of linguistics, but a filmmaker: the Galician director Oliver Laxe, playing himself. This, of course, transposes Bowles’ sometimes paradoxical concerns about the West, its hubris, and its horror and fascination with the Orient into the medium of cinema—and, indeed, into a reflexive mode of films about films, films within films, and films imagining other possible films. The various iterations of The Sky Trembles include behind-the-scenes footage of two other films in progress (Laxe’s Las Mimosas and Shezad Dawood’s Towards the Possible Film), and there are traces of older films, as well. One unspoken influence is Pasolini’s “location-scouting” films, like Location Scouting in Palestine (1965) and Notes Towards an African Orestes (1970), both of which find the filmmaker wandering the developing world for locations for his own possible films. A more obscure point of reference is the Catalan filmmaker Pere Portabella’s bizarre Cuadecuc, vampir (1970), which serves as a kind of model for Rivers’ sprawling project. Filmed on the set of Jess Franco’s Count Dracula, which starred Christopher Lee and Herbert Lom, the film even bears a very Riversian look, having been shot on an extremely grainy, high-contrast black-and-white film stock. (According to Jonathan Rosenbaum, the cuadecuc of the film’s title is “an obscure Catalan term meaning both a worm’s tail and the end of a reel of unexposed film stock.”) Like Rivers’ project, Portabella’s film sits uncomfortably between the making-of documentary and the fantasies about the film whose production it purportedly records. The many projects that make up The Sky Trembles weave sometimes imperceptibly between these two tendencies: of peering behind the curtain and becoming fascinated by its surface. Perhaps most straightforward is the book (published by Artangel and Cornerhouse Publications): bound in soft, red faux-leather, it’s laid out like a production scrapbook that hints at the project’s origins and inspirations with 128 pages of photographs, storyboards, maps, images of abandoned film sets Rivers found across the Sahara, and facsimile reproductions of Bowles’ “A Distant Episode” and several Mrabet stories. The book reveals Rivers’ project in its incubatory phase, and as such is a lovely object looking towards a possible film. Just as fragmentary, but more developed in its construction, is the installation version. Bearing the abbreviated title The Two Eyes Are Not Brothers, this iteration of the project was installed this past summer over two levels of a building that served as the BBC’s production facility in the Drama Block of Television Centre in White City, West London, from 1960 until 2012. Under a commission from the arts organization Artangel, Rivers transformed this disused production facility into a site of reflection on the artifice of production itself, with props, sounds, and projections from his project installed in various corners of the large facility once used to construct and paint sets for programs as varied as Top of the Pops, Blue Peter, Monty Python’s Flying Circus, and Top Gear. 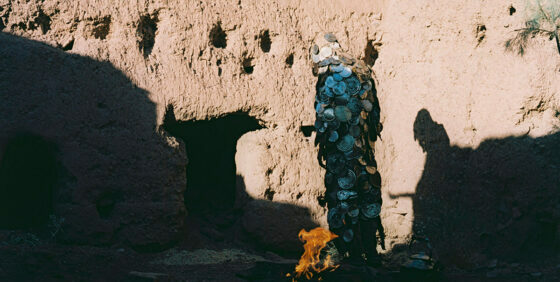 In one prop cage, there’s the tin-can suit that Laxe wears in the “Distant Episode” adaptation; in another, a scene of Mohammed Mrabet telling stories to Shakib Ben Omar, one of the actors in Las Mimosas, is projected on looping 16mm. Nearby, images shot from the back seat of a taxi of another Las Mimosas actor (who apparently disappeared during shooting) are projected, and in an airy interim space used for painting, excerpts from Carles Santos’ soundtrack to Portabella’s film—a bizarre cacophony of synth explosions, a soupy lounge theme, ambient knocks, jackhammer sounds, and jet-plane whines—plays on a loop. Most interesting among the assorted objects of the installation are a trio of custom-built mini-cinemas made from discarded film sets, in which Rivers screens outtakes from the film. Similar to the shacks that Rivers has installed elsewhere, these projection spaces are intricate, awkward constructions with two-by-fours sticking out like hedgehog spines on the outside, and Constructivist assemblages of faux-brick and plywood on the inside. With their hybrid manufacture, they exist on the border of cinema and its artifices—or, as Rivers puts it, “somewhere between construction and deconstruction.” Inside the mini-cinemas are projections (some film, some digital) of distinct episodes of Laxe directing Las Mimosas and acting for Rivers, and of Dawood directing Towards the Possible Film. While it serves as a kind of denouement for the installation, Rivers’ images of Dawood shooting Towards the Possible Film are omitted from the feature-film version. (It has a life of its own as a short film titled—to make things more confusing—A Distant Episode.) Dawood’s film is stylistically quite distinct from Rivers’ work, but it nonetheless serves as a more allegorical, sci-fi take on the sort of ethical encounters that Rivers’ film plays out via Bowles’ work and Laxe’s production. Recasting Legzira Beach in Sidi Ifni as an alien landscape, Dawood’s film concerns the meeting of a pair of blue-skinned, space-suited visitors and a tribe of more primitive-looking natives. Dawood’s film is shot in crisp HD and vibrantly colourful, but A Distant Episode takes on the distinctly crepuscular look of Rivers’ hand-processed monochrome, complete with abstract scratches, splotches, and end-of-reel flare-outs. Like Portabella’s film, Rivers’ footage frequently blurs the line between the film being made and the world off-screen, mixing images of death-scene rehearsals and costume adjustments with casual on-set observations of a wandering boom operator, local kids gawking at the film shoot, and a few stray dogs. discursive, unmoored qualities of the installation, finding, perhaps necessarily, a more narratively coherent form. But in this sense, it’s truer to Bowles and his tales of descent into the unknown. Just as Rivers’ narrative starts from the relatively solid ground of documentary before slipping, barely perceptibly, into fantasy (if not fable), Bowles’ Professor follows a similar drop, his nonchalance and blithe condescension gradually giving way to other impulses, to curiosity and fear, and then to violent forces utterly beyond his control—into “a state that permitted no thought,” as Bowles has it. For Bowles as for Rivers, this process is that of a dissolution of identity in the face of a non-Western Other, but it’s not without a complex reflexivity, a self-awareness about the artist’s role as a privileged white observer abroad in a romantic landscape largely of his own invention or projection. Thus the first episode of Rivers’ feature finds Oliver Laxe zipping taxis across the Sahara and shooting his film in the Atlas Mountains, where mules drag actors and equipment through canyons and over rivers: a transformation of a very real landscape into a location for cinematic mythmaking. It’s not the creation of a world ex nihilo, as in the digital realm of computer graphics, but something perhaps more difficult to comprehend: the casting of a real place for a fictional one. And just what is this artistic relationship to the real when it seems based on this kind of exploitation, even theft? At the heart of this project, like Portabella’s, is vampirism: the bloodsucking relationship between artists and their subjects, between films and other films, between filmmakers and reality. Throughout, Rivers’ film teases us with myriad questions about the exploitative nature of representation, and of cinematic representation, in particular. Are the local actors and extras and crew willing participants, or are they being exploited for their labour, their appearance, and their local flavour? To what extent is Northern Africa itself made to perform as an archetypal Orient, a backdrop or screen on which to project Western fantasy? And what of the great personal risk we see the actors submit themselves to: a stuntman falling from a great height onto a makeshift pillow of cardboard boxes; another seemingly cutting himself on Laxe’s tin-can outfit? All for the sake of cinema, perhaps, but whose cinema? Of course, it’s entirely too simplistic to see any of these artists as neocolonial opportunists. Laxe, for example, is a Sufi who has lived and worked in North Africa for many years—his relationship to his subjects here is far more complex than that of the archetypal European interloper. It is also a mistake to see these films’ subjects—or actors or collaborators—as either simply delicate prey or fully engaged creative partners, much less to presume the complexities of these relationships from something so partial and provisional as a film (or a book, or an installation). Instead, what The Sky Trembles makes visible is the whole parasitic network at the heart of cinema, beginning with its leeching upon the lifeblood of the real, and extending to an entire history of representation and art-making. Paul Bowles translated Mohammed Mrabet’s stories, but may have kept a few for himself; Rivers documents Laxe’s and Dawood’s films, but draws them into his own. Films partake in a history of cinema as stories draw upon older stories, in a relationship that is, at once and irresolvably, both collaborative and parasitic. In the film’s first half, Laxe is the exploiter, pushing his cast and crew onwards, just to the point of frustration; in the second, he walks off, hops in a car and, blasting some metal on the radio, wanders into another order of the real altogether. With barely a transition, Laxe steps into Rivers’ adaptation and into Bowles’ dark, postcolonial nightmare. (Those unfamiliar with Bowles should be warned that spoilers follow.) Beaten unconscious, his tongue cut out and fed to a dog, Laxe too is exploited, turned quite literally into a fetishized object—part metal and part animal. He is rendered voiceless and faceless, stripped of his identity, and made to dance and perform for the bandits’ amusement, and even, perhaps, for ours. At the film’s premiere in Locarno, Rivers described this as the character’s brutal metamorphosis into “a creature without an ego, without intention, without arrogance, without knowledge even.” Throughout the film, Rivers hints at this abstracted form of dehumanization through endless images of animals: horses, mules, and especially dogs (including the lucky mutt that gets to eat Laxe’s severed tongue). As Bowles once explained in an interview with The Paris Review, “The process of life presupposes violence, in the plant world the same as the animal world. But among the animals only man can conceptualize violence. Only man can enjoy the idea of destruction.” And here, surely, Laxe’s becoming-animal is something to be relished as well as feared, a way of absolving himself of his position as exploiter via an escape from the self. As in Bowles’ work, there’s a dangerous sense that this transformation, this violent loss of language and identity, might itself be an easy way out, a romantic notion of the reduction of the self that perhaps bears more than a whiff of Western privilege. But Rivers is careful to suggest that this process is an ideal rather than a certainty, and the end of the film hints at an ambiguous fate for the apparently egoless artist: perhaps the self is not so easily avoided after all. If we take Rivers’ film as a fable for the cinema, even a utopian one, it’s nonetheless one that opts for the cinema of encounter over the cinema of control, one that fully rejects the notion of the pre-eminence of artistic vision over reality. If auteurism exalts the filmmaker’s ability to bend the wayward elements of reality to his singular, personal vision, Rivers’ film suggests precisely the opposite: that cinema is a space for collaboration and collusion, however messy they may be. It exists precisely at the moment in which personal vision, confronted with the real, dissolves into a wider and wider network of contingencies and affiliations. And if this makes the remains inescapably complicated, perhaps this ambivalence, this dance between exploitation and submission, is itself something to be embraced.